1 Why Are Chickens Eggs Shaped like…Well, Chicken Eggs? 2 Do Chickens Lay at the Same Time Every Day? 3 What Do You Call the Tiny Eggs That Chickens Sometimes Lay? 4 What If Chickens Won’t Lay in Their Nest Box? Domesticated chickens have been providing humans with eggs for nearly 8,000 years, but having access to freshly laid eggs is no longer restricted to those living in the country. For the last few decades, the idea of the “urban farm” has seen an increasing number of suburbanites keeping their own poultry. 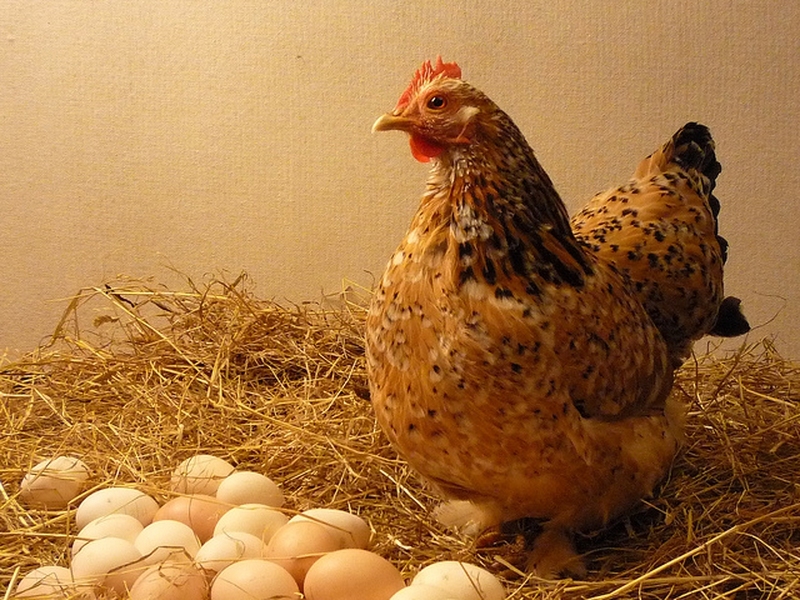 With this renewed interest, you’re not alone in asking: How do chickens lay eggs? ​The process is actually something of an oxymoron, elegantly simple and yet infinitely complicated. It’s one of the little miracles of nature; so, how do chickens lay eggs? Funnily enough, the whole egg laying process begins with a small gland near the chickens’ eye. This tiny gland is light receptive and when it registers light (either natural or artificial), it triggers the release of an egg cell from the chicken’s ovary. This egg cell travels to the uterus, where it will eventually grow into the egg yolk. Meanwhile, the chickens’ uterus gradually fills with a jelly like substance, called albumin, more commonly known as the “egg white”. A membrane then begins to develop around the perimeter of the uterine walls, effectively sealing in the egg yolk and albumen. In time, a combination of calcium, salt and water rims this membrane to form a sturdy outer shell. Once the egg is fully formed, the real work begins. The chickens’ muscles will start to contract in an effort to release the egg, forcing the egg to move down the vaginal canal towards an external opening, called a vent. This vent is also connected to the intestinal canal and is used by the chicken to expel waste. Mid-way through its journey, the egg will reach an internal flap, called a cloaca. The cloaca is like a valve, which only allows one canal access to the vent at a time. Once the egg reaches this point, the cloaca valve descends and blocks the intestinal canal. Once the egg has almost completed its journey, the chicken will stand up and then lower its back end, which causes the vent to open as wide as possible. The strengthening contractions essentially turn the chickens’ canal and cloaca inside out, forcing the egg to drop free onto the ground. Ta da! An egg has been laid. So now you got the answer to "how do chickens lay eggs", are you ready to start raising poultry? Before you rush out to buy a chicken of your own, here are a few more things you may need to know about chickens and eggs. Why Are Chickens Eggs Shaped like…Well, Chicken Eggs? Did you know that the distinctive shape of a chicken’s egg actually mirrors the shape of the chickens’ uterus? The shell forms along the edges of the uterine wall, so the end result is just a mirror image of the space it was formed in. That’s why all chicken eggs are roughly the same shape. Do Chickens Lay at the Same Time Every Day? A lot of people assume chickens lay bright and early every morning. In fact, they actually work on a 25 hour cycle, so every day the egg will arrive around 1 hour later than the day before. But because chickens won’t lay in the dark, once their laying cycle reaches dusk, they will skip a day of laying and then the time cycle will start all over again the next morning. What Do You Call the Tiny Eggs That Chickens Sometimes Lay? Periodically a chicken may lay a tiny, useless egg. This happens when the egg passes too quickly through the chickens’ oviduct, and poultry farmers refer to these as “fart” or “oops” eggs, although perhaps not the official scientific name for them. What If Chickens Won’t Lay in Their Nest Box? Chickens, surprisingly, can be trained by example. If you have a chicken that lays her eggs wherever she feels like it, leave either a fake or real egg in the designated nesting box. The chicken will get the picture and start laying there instead. Yes, it’s a bit disturbing, but chickens will occasionally eat eggs. Generally this only happens if an egg is accidentally broken, and it’s nothing to worry about. However, if you have a chicken that starts breaking eggs deliberately so they can eat them (Hannibal Lector style), then it’s best to remove that particular chicken from the flock. Server responsed at: 04/25/2019 2:19 p.m.